100% live rock, pop-rock drum loops and samples. It’s a no-nonsense, multi-purpose songwriter toolbox of groove, plain and simple. Is there anything better than 100% pure natural drums and capturing the unbridled energy of a pro drummer laying it down? Beta Monkey delivers a diverse set of drum loops specifically crafted for pop songwriting, whether you like to take in a rock, alt, funk, or punk direction. This set is all about usable grooves that are song ready in terms of playing styles and drum mix. If you’ve searched high and low for drum loops online, get Drum Werks VII into your DAW and see what you’ve been missing. 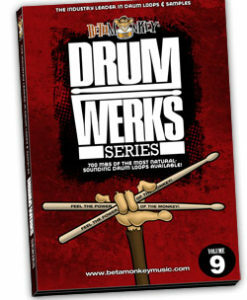 Drum Werks VII features over 900 acoustic drum loops and a complete matching multi-velocity sample set, covering a wide array of indie rock and modern rock songwriting styles with a bit of pop, funk, and punk influences as well. 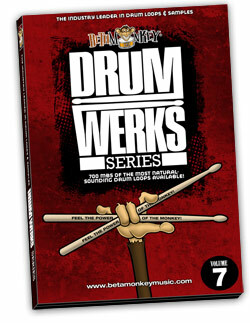 Drum Werks VII | Versatile Drum Loops for Rock, Pop Rock, Alt Rock and More. If you write rock, alt rock, indie rock, or pop rock, Drum Werks VII will get your next set of tunes off the ground quickly. Drum Werks VII is a versatile and cohesive collection of beats, grooves, and fills with a complete matching multi-velocity sample set. Versatile and infectious grooves and feels – 100% live from our studio to yours – available in ACID WAV, APPLE LOOPS, and REX2 loop formats.. This live collection of pure acoustic drum loops includes 10 different tempo sets, each with a solid foundation of core grooves with a creative variations for each. Enough live, energetic grooves to create full drum tracks easily and without the dreaded “sounds like a loop” syndrome. Your acoustic drum tracks will shine with great rock feel and live, rock solid energy. Clearly, the focus is for straight-ahead rock tracks and alt and Indie rock songwriting. But, this collection of beats and fills is for any music needing live, acoustic drums. Try them in other genres such as pop, experimental, and electronic music – wherever you you need the human, unquantized feel of a rock drummer. Drum Werks VII is a go-to collection for any songwriter. Great new sounds, great new grooves – guaranteed to inspire anyone who needs drum track inspiration. Be sure to add the follow-up to Drum Werks VII: Drum Werks VIII. Full Range of Rock Drum Styles: Straight-ahead grooves, rock with a dash of funk, laid-back or high-energy, Drum Werks VII covers a lot of ground. Grooves sets ranging from 79 BPM all the way up to 175 BPM, you’ll find the right grooves for nearly any new rock project. Straight 8th feels as well as funk swing magic – versatile and eccentric – a groove for anyone or any style needing live studio drums. Comprehensive Groove Folders: Grooves sets are arranged logically and with healthy coverage of various tempos. Whether you need straight-ahead 2’s and 4’s or you need some heavily syncopated rock patterns, Drum Werks VII features Groove Sets ranging from 79 BPM all the way up to 175 BPM. Cohesive Drum Sounds: A natural, live drum sound, with a good amount of room in the mix. A sharp crack to the snare, punchy kick, and naturally resonant toms – all drum loops and samples were performed on a custom Smith Custom Maple drumkit. The clean, natural, and present mix is consistent throughout Drum Werks VII (and also on Drum Werks VIII), giving users a cohesive sound set with all drum loops are taken from the SAME recording session – perfect for mixing tempos and feels as well as making final mixdowns a breeze. Fully-Sampled Drum and Cymbal Samples: Multi-velocity samples of all the drums and cymbals recorded are included. Smith Custom Maple drums were used and sampled for these sessions. All cymbals (Zildjian ride, hihats, crashes) are included as well. Compatible with Drum Werks VIII: Same session, same versatile drum sound. Drum Session Recording Details: Check out some info from the recording of Drum Werks VII. 915 (570 MB) original, license-free 16/44 drum loops and samples. Available as 16-bit ACIDized WAV, APPLE LOOPS/AIFF, and REX2 loops. 267 (123 MB) multi-velocity drum and cymbal samples. Thank you for being part of my recording history on my projects from the very beginning. I love this series I haven’t even scratched the surface yet! But I have been in love with your products from the get-go. Awesome company amazing loops Thanks BM!